Are you a process engineer, facility engineer, instrumentation technician, maintenance specialist, the manager of a technical or process manufacturing discipline or in school studying to move into any of these fields of endeavors--where the processing, storage or handling of powders and bulk solids will take place? Then this book is for you! Within this book you will find the subject of level measurement and detection of powder and granular bulk solids is covered in an easy to understand manner allowing you to choose to study, skim or just reference any chapter, the entire book from front-to-back or jump around by topic. Each chapter deals with a specific subject and includes a chapter summary, objectives, study questions and answers. 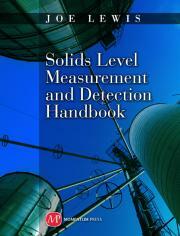 Do you need to find a solution to a solids level measurement problem? Do you need to have a general knowledge base regarding solids level measurement and detection, but can only find paragraphs dedicated to the subject in other reference books? Your answer is likely found in this book where noted author and expert Joe Lewis provides the in-depth information you need all in one place. This book is destined to become an industry standard reference manual for all industries that deal with of level measurement and detection of bulk solids. Joe Lewishas over 35 years of experience in the process measurement and control industry. He has served critical roles within engineering, production, sales and marketing areas at such companies as BIF, The Foxboro Company (Invensys), Taylor Instrument (ABB), and Monitor Technologies. His education includes a BS in electrical engineering technology from Roger Williams University and a Masters in Business Administration from Bryant University.